In the past year, given a flood of national press coverage, which included appearances on ESPN and NBC television, ECU fans caught a glimpse of where Brenner is today. With he and wife, Jennifer, struggling to find a cure for a yet-to-be-diagnosed neurological disorder affecting their daughter, Bailey (3), the national media locked on to a young couple who refused to take the “hand” life had dealt them and relentlessly – to their own financial demise – pursued a cure for their child. 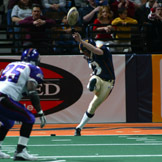 On the way, the story took a life of its own as Brenner came out of retirement to kick footballs for the Colorado Crush of the Arena Football League, not because he missed the game – though he did – but because he needed to find a cure and the financial support professional football provided would be a means to end. Brenner had, in essence, re-emerged for ECU fans, who took a keen interest in their former kicker’s desperate situation. The nation responded, too, contributing to a fund to help Bailey, whom this writer is happy to report, is doing quite well these days. Having exorcised, to an extent, the demons that surrounded Brenner’s rapid exit from the collegiate football scene, the former Pirate kicker had long wished to somehow convey what was going on in his life during that time. He had carried a tremendous amount of shame about letting down his teammates, coaches, and fans – even more himself. Yet, he found it impossible to even be in Greenville after he departed or even think about it for some time. “This is probably… the first interview I’ve ever done where I’ve really got in depth with what really happened and why I left East Carolina and didn’t continue my career,” Brenner said from his home in Denver. A little background is necessary to fully understand Brenner’s situation. 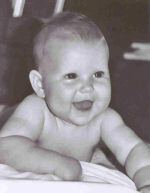 At two years old, Brenner’s father and mother divorced, prompting the young mother to move home with her parents. Her father, affectionately called Daddy Beau by his family, had purchased 17 acres of land in High Point, NC, where most of the extended family – three generations of furniture builders – built homes and settled. It was here that Brenner grew up and it was Daddy Beau who was the linchpin male figure in upbringing. So it was in February of 1990, as Brenner returned to High Point following a ski trip with friends, that he arrived at the family home to find a host of sheriff’s cars and an ambulance in front of the house. Though he didn’t know it at the time, something had broken inside of him. Brenner found a strength inside, using his grandfather’s death as a striking stone to ignite an internal desire to exceed all expectations of himself as a football player in the 1990-91 seasons. As history bore out, the 1991 season was a milestone in the ECU football history. The Pirates finished No. 9 in the final season rankings and capped the season with a rousing come-from-behind Peach Bowl victory over North Carolina State. In the wake of that victory, Brenner had become a known commodity in the collegiate football ranks, finishing the season as the nation’s fifth best kicker. By the time the 1992 season previews would hit the newsstands, the rising junior would be listed as a pre-season All-America. Also by that time, Brenner was done with football and would never don a Pirates uniform again. While it may be difficult to understand for many fans, instead of using the victory and a successful memorial to his grandfather to boost himself up, Brenner crashed hard after the season. “After the Peach Bowl was over, it was really over for me,” he said. “The previous 11 months, I had dedicated to Daddy Beau. At the culmination of the Peach Bowl, I felt it was really over. I felt that I had nowhere to go but into the cellar. Things started to lose meaning to me. I stopped going to class. I started to drink a lot more alcohol than most college students do. I was staying out all night, carousing. I wasn’t putting forth the effort in class or in training. I put myself in such a hole that I could not dig out academically. Fighting his own depression, Brenner was determined to make a run at regaining his eligibility. He packed his bags and moved to Florida with a close friend, a soccer player who had also been kicked out of school for academic reasons. The following summer – in 1993 – Brenner departed Greenville for good. He was still down and feeling like it was only getting worse. Still, though resolved with his personal history, Brenner recognizes with pain that his depression could have probably been dealt with before all had been lost at ECU. Over the years, Brenner has come to understand that, though there may have been disappointment at the time, his name largely is associated positively with the 1991 season, and by that virtue, his name generally brings a smile and happy reflection on a truly good time at ECU. He was a state caliber soccer player at High Point Central High School, but Brenner was a virtual unknown as a kicker. Though his potential was clearly visible to those who looked, he was somewhat hidden. He was recruited by Florida State and North Carolina while being pursued by North Carolina State. Brenner was looking at schools to satisfy another passion. A memorable freebie if ever there was at ECU. “I competed with Robb my true freshman year for PATs and field goals,” he said. “I won the field goal and PAT job for the last six games of the season. I remember one of the most memorable games for me my freshman year was the game against Miami. It was on my birthday and I kicked a field goal against them. During the off-season after his freshman season, Coach Lewis opted to red shirt Brenner to allow Imperato to kick his senior season and preserve the maximum eligibility for the team’s emerging young kicker. Though he chose ECU in part for its Art program, Brenner soon learned that on the collegiate level, there is little time for more than one passion, so he had to make a tough decision. Clearly focused on football, Brenner knew he was much improved heading into his red shirt sophomore season. But, he and his teammates had no real clue about what would unfold ahead. “I already knew that we had great players and had potential to be a great team,” Brenner said of the build up to the 1990-91season. But I really do not believe that anyone in the organization had any idea of how it was actually going to take place. We knew we had some pre-season All-American guys, but we had no idea that we would finish in the top 10 and win a major bowl game. As a kicker, Brenner found out right away that his game had elevated. 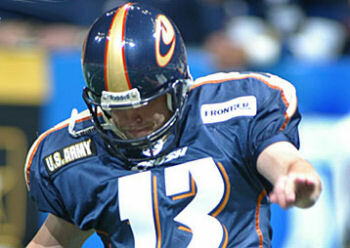 Of course, that 51-yarder and the onsides kick were just the beginning for Brenner that season. “I remember another high point for me personally was the Syracuse game,” he recalled. “I kicked another 50-yarder and had probably my best kicking game of the year. Then there was the game against Pitt at home, which was one of the best wins I have ever been a part of. I am sure everyone remembers that game. Ironically, for Brenner, his final game as a Pirate, thought it was a big one on a big stage, was a bit anticlimactic from a kicking perspective. In the wake of the Peach Bowl, Brenner was named first team All-South kicker, which was a key honor as ECU was an Independent at the time. Several publications listed Brenner as a pre-season All-America for the following season. Having given up a dream of his – to be a professional football player – Brenner’s fall from grace also marked the beginning of what would be a tough climb out of the grips of depression. Along the climb, Brenner would find a helping hand that has meant the difference in his life. 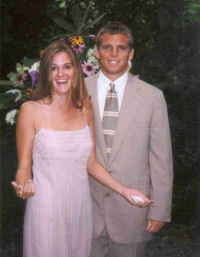 “You know, when my wife and I initially met, we met in the year and a half after I had left Greenville,” Brenner said. “I was doing odd jobs at home and doing nothing really with my life. Really, I should say I was mooching off of my parents, taking advantage of them. Patient, loving, and caring, Brenner’s wife was a beacon for him as he fought to reconcile himself with his grandfather’s suicide and his subsequent failures. With newfound happiness on the horizon, Brenner was able to right his personal ship and in the fall of 1994, he found himself back on a path he thought he had strayed too far off to ever return. One of those scouts was Jim Pop, an assistant coach for the Baltimore Stallions of the Canadian Football League during the league’s venture into the lower 48. Brenner would go on to play for Charlotte in 1995 and 1996. It was unlike the game he was used to. “You know, it certainly is a lot different now than it was then,” he said in reference to how far the league has come since he played in Charlotte. “I remember that first season was almost like playing in the Miami game when I was a freshman at ECU. I knew I could compete, but going from big uprights and then to 9-foot (wide) uprights and playing inside, kicking into nets was so new and intimidating. I did not have a good first year kicking there but Coach Kay and I had struck up a good relationship and he saw my potential. It might have been because in my first game I got hit and flew over the boards and separated my shoulder and then came back to kick the game-winning field goal. Ironically, that game-winner was against a team that my current head coach was the coach for back then. During their first stints in the Arena Football League, players generally sign a one-year contract and then fend for themselves each off-season. For Brenner, it meant that there were a couple of other teams to consider. Though the guy he beat may have ended up as a journeyman in the NFL, Brenner went on that season to have perhaps his greatest year to date as a professional. A rising star once again, Brenner would again drop off the football map. But this time, it was for all of the right reasons without any negatives attached. Brenner didn’t really look back until he was called by White a year-and-a-half later and asked to be the rescue kicker for a three-week stint while the Rattlers kicker healed up from an injury. Brenner admits that after his first two years away from the game without a thought about it, it started to creep back into his mind. After leaving the game in 1999, Brenner and his family moved to Winter Park, FL, where Jennifer was a teacher and he became involved in the furniture business. He quickly rose to the level of national sales rep for a company, but he was not fulfilled. “We moved to Florida in January of 1999 and I was in furniture sales at the time and selling to hotels and resorts,” he recalled. “My family is three generations deep in the furniture business and I was in sales for 3 ½ years. But, I was very unhappy traveling and being in a coat and tie. It wasn’t me… I wasn’t able to be myself. Brenner admitted that working with prep kickers from around the country went a long way in filling any void that may have been created when he left football. But a couple of events, one major and one minor, changed all of that. 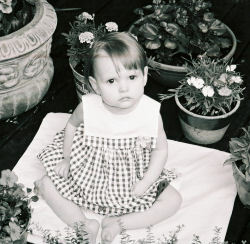 In June of 2001, Brenner’s daughter Bailey was born. It was soon discovered that something was not right as the child was suffering from daily seizures. Her vision going, her hearing gone, and her development nearly stopped cold. When doctors failed to uncover what was going on in little Bailey, the Brenners set out on a relentless quest to do whatever they could to help their daughter. Part of that quest would bring Brenner back to football. Brenner knew that in the years since he left the AFL, things had changed within the league. The league was a far cry from the $250-a-week gig he had when he first started. The NFL Players Association now represents the players, there are 401-k plans, full benefits and the salaries are up by more than 1000 percent with the NBC television contract. And the medical benefits were there. As fate would have it, the special teams coach for Colorado was a coach that Brenner had played for in Charlotte. Brenner officially signed in October and left Florida with only one regret. For the record, Brenner’s team won the district, region, conference, and lost in double overtime in penalty kicks to the No. 1 team in nation in the semifinals. During the tournament, Brenner was still there, via phone, to support his girls. The move to Colorado has been a good one in every way possible. “Colorado is better than I ever thought and it is just going to get better as we settle in and meet more friends,” he said. Personally, the return to football to help offset the medical bills for Bailey’s treatment was the best thing they could have hoped for Bailey. The local press got wind of the story… followed by the national press. A trust was set up for Bailey and people from all of the country poured out their support to the Brenners after hearing their story. Today, Bailey has been seizure free for two years, her vision is back, her hearing is back and her development is progressing. Professionally, things are equally on good footing. Though on a two-year contract, Brenner said that his performance this past season has opened the door to a renegotiation of his contract. And yes, lest anyone be wondering, he has often thought of the NFL. Though Brenner has not been back to Greenville since a 1996 visit, he follows his Pirates closely. Despite the distance, Brenner says he still feels like he is a part of the East Carolina fabric. Still, he cannot completely void his days at ECU and wouldn’t want to. He was a big part of the biggest football year in the Pirates’ program and of that he is proud and for that he is thankful. He has come to peace with it and now looks back and feels good about where he is.